95Wh Graphite Lithium-ion rechargeable battery. Allows quick and convenient attachment/detachment to Sony-compatible equipment. This mechanism offers extremely high durability and reliability, suitable for the harshest environments encountered in ENG operations. 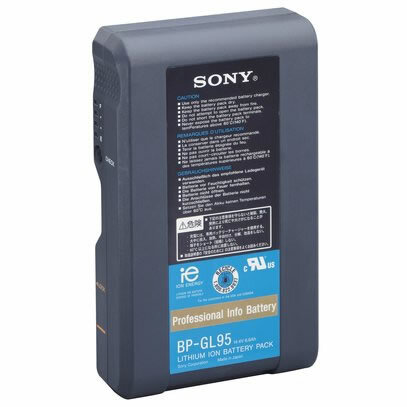 Sony V-mount batteries can be directly attached to most Sony professional camcorders including XDCAM™, MPEG IMX™, DVCAM™, Digital Betacam™, Betacam SX™, and HDCAM™ series. Remaining capacity indication in 20% steps with green LED (more than 80%, 60%, 40%, 20%). Remaining capacity indication in 5% steps with orange LED after capacity falls below 20%.